Okay, this page is for collectors and geeks mostly, but it could be a useful tool if you're considering buying a steel guitar sight unseen and you're worried about how easy slants will be on the lower frets. Here's a little tool that will allow you to figure out how easy bar slants are on any steel guitar. It calculates the angle for a slant that spans adjacent strings and adjacent frets—for example the slant from string 2, fret 3 to string 1, fret 4. This is a difficult slant to do on the lower frets and therefore a good measure of slant difficulty. The angle computed is the number of degrees the bar moves clockwise from straight bar position (see diagram). So 0° represents no slant at all and 75° would represent a severe slant angle. 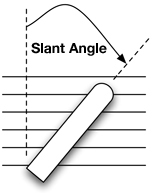 Calculator results show angles over a range of frets to give you an idea of "slant-ability" up and down the neck. To evaluate the results of the above the script you need some sample steel guitars to compare the results to. The following table shows slant angle info for four common models in order of increasing difficulty from the very easy bakelite Rickenbacher to the very difficult 1953 Fender Stringmaster, which not only has an ultra-long 26" scale but very narrow string spacing. The rating number represents the fret below which slants will be difficult. So for steels with a 1 rating, slants will be doable at all frets. For Fenders with a 5 rating, slants below the 5th fret will be difficult. The system is based on my observation that slants of 73° or less are doable for most players. When measuring spacing and scale you can use either inches or centimeters, but do not mix units. If you use inches, you'll have to convert partial inches to a decimal—e.g., 43⁄4 inches = 4.75. Measure the distance from the middle of the nut to the middle of the bridge. This will give more accurate readings in cases where the width of the bridge is significantly greater than the width of the nut. If the nut or bridge are a round surface, measure from the highest point. With your ruler at the nut, measure the distance between centers of the top and bottom string. With your ruler at the bridge, measure the distance between centers of the top and bottom string.